Chroma 11210 battery cell insulation tester is an instrument used for accurately measuring leakage current (LC) and insulation resistance (IR) of battery jelly-roll/dry-cell as well as various insulation materials. In addition to standard LC/IR measurement, the 11210 has a unique function that detects partial discharge (PD) or flashover that may have occurred inside the insulation material during the high voltage insulation testing process. 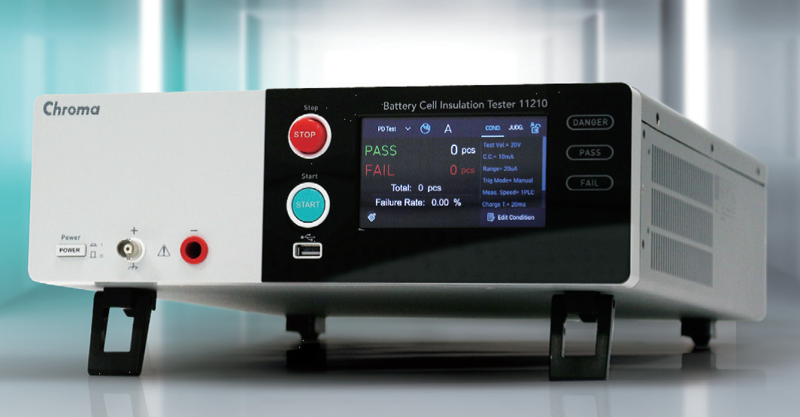 The Partial Discharge (PD) detection function of Chroma 11210 has the ability to detect defects inside the battery cells in the dry cell stage prior to electrolyte filling. When there are burrs on the electrode metal sheet or defects (impurity particles) inside the insulation layer (the separator sheet) in the dry cells, the insulation distance left between them is shortened but not shorted. In most cases, they cannot be detected by regular insulation LC/IR tests, since the internal short circuit does not exist at the time of executing the tests. The 11210 is the only instrument that can help detect possible shorts in the very early phase before any failures can occur. Charge current : 50mA max.